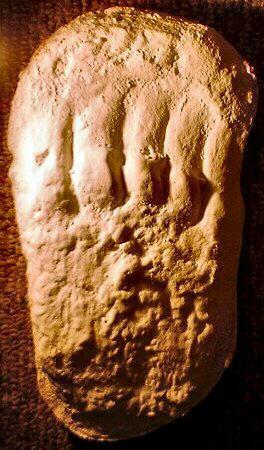 These footprint photographs were originally cast by Primate Anatomist Dr. Jeff Meldrum of Idaho State University in 1996, in the Blue Mountains near the Umatilla National Forest, right outside Walla Walla, Washington. The isolated trackway consisted of 40 plus footprints. Dr. Meldrum analyzed the trail and found that the tracks had proceeded out from a remote drainage, went down a muddy farm road, across a plowed field, continued along an irrigation ditch and back into the woods. Other clues were found in the trail of footprints... At one point, the animal that made the tracks had been spooked by something, turned and walked back, looking to the right every other step. It then increased stride and went up an incline, leaving a few 'half tracks'. From there the tracks crossed the field towards a brushy area. The tracks were fresh and some dermatoglyphics were visible, but rainy conditions quickly washed them away. The footprints showed variations in toe position which were consistent with the estimated speed of the animal and the different irregularities in the substrate. The tracks measured approx. 13 3/4" long by 5 1/4" wide. Step length (not stride) ranged from 3.25-4.25 feet. What Meldrum found to be the most interesting observation in this trackway was the evidence of great flexibility in the midtarsal joint. 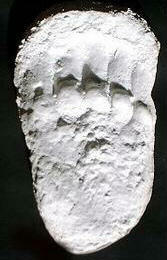 Several footprints showed this midtarsal break, (flexed at midfoot) and therefore created "half tracks". Other examples of half tracks have been found in California - Blue Creek Mountain Road, 1957, Washington - Grays Harbor County, 1982, there were examples of a midtarsal break in some of the tracks at the Patterson filmsite to, as well as other areas. The second photograph is a footprint that showed the midtarsal break. It also has another interesting features; toe slide-ins. This footprint was found going up an incline and because of muddy conditions the foot had slipped back leaving toe slide-ins. The reason only half of the foot registered is that the heel was elevated upon impact (presumeably flexed at midfoot). The proportions of this half track agreed with the full-length tracks. Without toe slide it measures about 8" long and is slightly over 5 1/4" wide.